My blogging seems to be less and less frequent these days. Work has been very busy lately because of an event we're holding next Friday; consequently, I've been avoiding getting on the computer any more than I have to, since I spend most of my work time in front of a computer screen. I also worked late almost every evening this week because I took Friday off to attend my friend's Mom's funeral. It was a beautiful funeral Mass for a lovely lady. I can still remember the first time I met her, in the sixth grade when my friend invited me over after school. Mrs. D. was very joyful and funny! Today I look seriously bug-eyed. 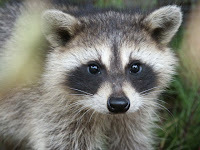 The unfortunate combination of allergies, a sleepless night, too much time on the computer, and weepiness from yesterday's funeral have resulted in a rather raccoon-like appearance. I must go douse my eyes in cold water. Later this morning, I'm off to an art show at Todmorden Mills. My favourite Professor is part of the Don Valley Art Club and has invited me to attend this event as her guest. I'm looking forward to it!